St. Paul, Minn., March 29, 2019 – PolyMet Mining Corp. (“PolyMet” or the “company”) TSX: POM; NYSE American: PLM – today reported that it has filed its financial results for the year ended December 31, 2018. PolyMet is fully permitted to construct and operate the NorthMet copper-nickel-precious metals mine and processing plant located near Hoyt Lakes, Minnesota. The financial statements have been filed at www.polymetmining.com and on SEDAR and EDGAR and have been prepared in accordance with International Financial Reporting Standards. All amounts are in U.S. dollars. Copies can be obtained free of charge by contacting the Corporate Secretary at First Canadian Place, 100 King Street West, Suite 5700, Toronto, Ontario M5X 1C7 or by e-mail at info@polymetmining.com. In March 2019, the company received the federal Record of Decision and wetlands permit from the U.S. Army Corps of Engineers, which is the last key permit or approval needed to construct and operate the NorthMet Project. In March 2019, the company and Glencore AG (“Glencore”) agreed to extend the term of the outstanding debentures to provide the company time to prepare for and complete a rights offering by June 30, 2019, fully backstopped by Glencore, to raise sufficient funds to repay all outstanding debt. In December 2018, the company received all Minnesota Pollution Control Agency permits for NorthMet for which the company had applied, including air and water permits. In November 2018, the company received all Minnesota Department of Natural Resources permits for NorthMet for which the Company had applied, including the Permit to Mine, dam safety and water appropriations permits. In June 2018, the company and U.S. Forest Service completed the federal land exchange giving PolyMet title and control over both surface and mineral rights in and around the NorthMet ore body. In March 2018, the company issued an Updated Technical Report under NI 43-101 incorporating process improvements, project improvements and environmental controls described in the Final Environmental Impact Statement and draft permits. The update also included detailed capital costs, operating costs, and economic valuations for the mine plan being permitted, as well as a discussion of potential future opportunities. Execute construction finance, subject to typical conditions precedent. 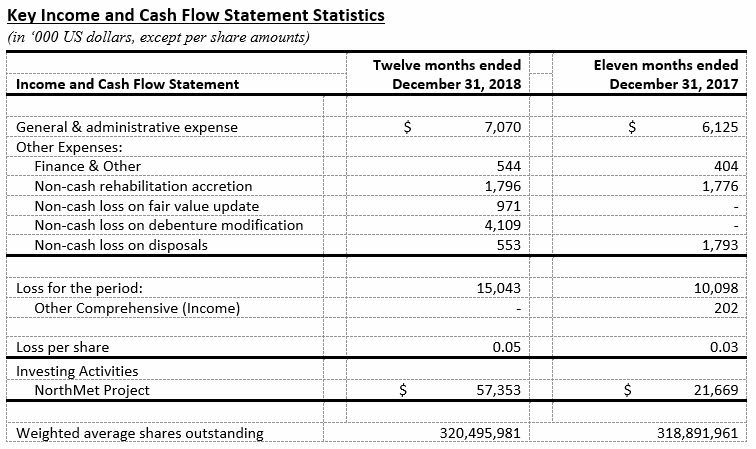 Loss for the twelve months ended December 31, 2018, was $15.0 million compared with $10.1 million for the prior year period. Excluding non-cash compensation, general and administrative expenses for the twelve months ended December 31, 2018, were $3 million compared with $4.8 million for the prior year period. PolyMet invested $3 million cash into its NorthMet Project during the twelve months ended December 31, 2018, compared with $21.7 million in the prior year period. The current year includes $21.1 million in wetland credit purchases and $10.0 million to fund the environmental rehabilitation trust required under the Permit to Mine. PolyMet Mining Corp. (www.polymetmining.com) is a publicly traded mine development company that owns 100 percent of Poly Met Mining, Inc., a Minnesota corporation that controls 100 percent of the NorthMet copper-nickel-precious metals ore body through a long-term lease, and owns 100 percent of the former LTV Steel Mining Company processing facility, located approximately seven rail miles from the ore body in the established mining district of the Mesabi Iron Range in northeastern Minnesota. Poly Met Mining, Inc. has completed its Definitive Feasibility Study and received all permits necessary to construct and operate the NorthMet Project. NorthMet is expected to require approximately two million hours of construction labor, create approximately 360 long-term jobs directly, and generate a level of activity that will have a significant multiplier effect in the local economy. Specific reference is made to risk factors and other considerations underlying forward-looking statements discussed in PolyMet’s most recent Annual Report on Form 40-F for the fiscal year ended December 31, 2018, and in our other filings with Canadian securities authorities and the U.S. Securities and Exchange Commission.